The Mayor and Bishops Good and McKeown joined by representatives from the charities. Local people have been urged to dust down their Christmas jumpers to help become world record breakers. The city is now poised to host a new Guinness World Record bid on Sunday, December 18, at 11.30am at Waterloo Place with thousands expected to take part in festive tops. The event is being arranged to raise money for Foyle Hospice, Children In Crossfire, Concern Worldwide, the Mayor’s Charity and Muscular Dystrophy UK. 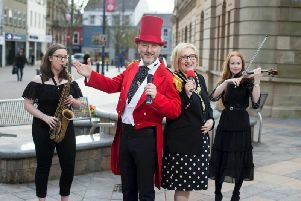 Catholic Bishop of Derry Donal McKeown and Church of Ireland Bishop Ken Good said the event was a great way of showcasing Derry’s generosity and sense of fun.